I recently read in the papers about the plight of a family whose annual income was reduced from £70K to barely scraping by on £900 per month due to recession. The article also mentioned that the couple often went hungry and eating only one meal a day, surviving on processed food so that the two older teenage sons could eat. I think this also brings to home the fact that it's essential to not only save for the rainy day but to invest wisely for the future. I don't think it's that difficult for a family of 4 to eat healthily for less than £5 a meal. 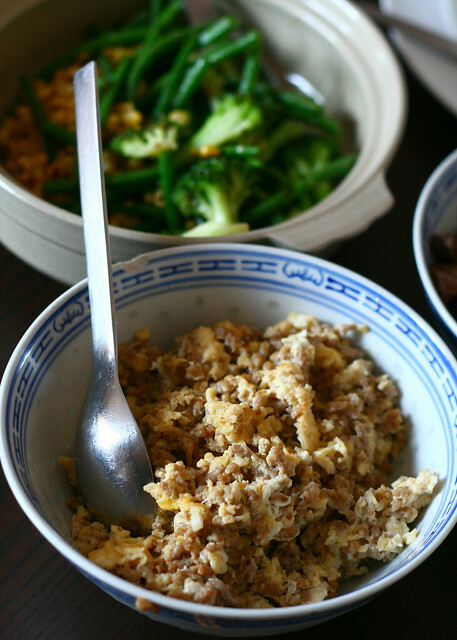 In this case, the raw materials are pig liver (87p), 4 eggs (88p), 165g pork mince (77p), 100g beans (80p), 125g broccoli (47p), corn (99p) and 200g rice (34p). The total was £4.65. It would've been far cheaper if I hadn't used corn but there you go. As long as you stick to good quality but cheaper cuts of meat, you'll still get ample protein as well as the necessary vitamins from the veggies. I'm not a huge of offal but it's cheap and nutritious. I often suffer from flaky skin around the mouth due to zinc and magnesium deficiency which if I'm not careful would crack and bleed. I'm not a huge meat eater but after a dose of liver which is packed with the two minerals, my skin heals within 24-48 hours without any need for supplements or medication. Pig liver is delicious when stir fried with slices of ginger, a bit of chopped garlic, doused in dry sherry and light soy sauce as well as a sprinkling of sugar. How do you feed your family for £5? Do share your stories and tips. "it's essential to not only save for the rainy day but to invest wisely for the future." As I grow older, I appreciate this advice more and more. How true! I feel I should reduce the amount of money I spend on clothes and be more more proactive in saving. I am always so impressed by how you manage to cook healthy and great meals for your family for only a few £. Love your advice about saving and investing in the future. As I grow older, I really should start thinking of the future. Oh Logomania, good for you, it has only sunk in that I will be old soon, and better start building some savings, when I was in my 20's I was all about designer clothes and bags and blowing every penny. Of course, I own none of them now, investments my patootie. Well, it's just the two of us and our food budget is very low, it probably averages about that or even less most nights, I cook from scratch, and like you, when we have roast chicken I get 4 or 5 nights out of it! My family meals often come in for under a fiver. We tend to eat the old fashioned foods I was bought up on like Toad in the Hole, Cottage pie etc so easily cost under that. I don't think its the meals that make your weekly shop expensive, its cleaning products, loo rolls and all the things the kids like to snack on. If I didn't buy chocolate, biscuits, cake and soft drinks we would be so much better off! Chicken coriander noodles for us. Chicken thigh fillets (cheaper, more tender and tastier than breast) sliced up marinaded with the usual asian condiments and garlic and ginger. Some green leaves (lettuce or bok choi) in a soup base and rice noodles (hor fun). Works for us. It amazes me how the food costs keep rising in the past few months here in the states. I normally buy the same things/ingredients but the costs are insane. We use 98% fresh produces /meats in my cooking, no processed food. I think buying organic/premium products add to the high costs but i only buy certain organic stuff like milk/certain fruits/veggies that have high level of pesticide contamination. Finding recipes that use less meats is also a key, forget about a big and juicy steaks for dinner. Asian food is very economical. I start growing my own veggies too. It is quite challenging as my husband is a meat eater but i am not, so i have to find something his canivore palate can tolerate. awesome post~~~ high quality food, low cost perfect!!! gosh that's tough. I'm not a very good cook, but I'm sure if I had children I could get creative. I think I would do some chicken found on sale and a big bag of rice which would last a while. I firmly believe in saving for the future as well esp. since costs for everything just keep rising. I'm very fortunate to live right by Chinatown so I'm able to do my food shopping there and get fresh produce for much less than my friends do. For health purposes, we're part-time vegetarians and eating veg is less costly than having meat at every meal. 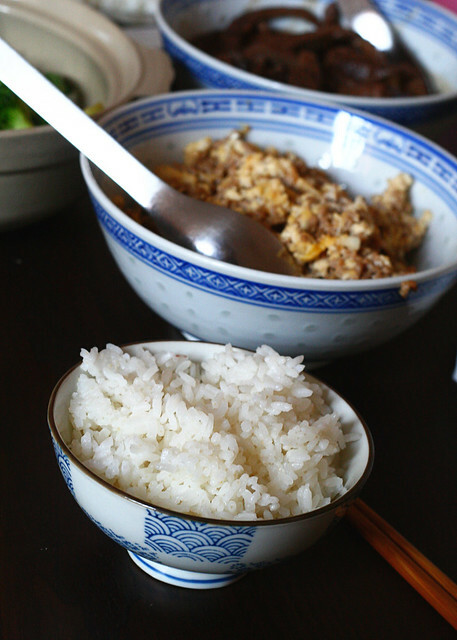 I also find that cooking Asian food is not only easier but also more economical. An awesome idea, Marlene!! Also - totally spot on re: saving. Brilliant post Marlene. You really showcase how well people can eat and get great value for money. Of course it's far more healthy then the processed alternatives and far far cheaper! I'm not a big offal fan either but I know my family always talks about the benefits. I think a healthy and nutritious meal can definitely be cooked inexpensively by buying the whole chicken and deboning it yourself versus buying a skinless / boneless chicken breast. Veggies are pretty inexpensive too especially if you know where to buy them (like Asian markets). Great post! Yes, the recipes can be easily halved. I tend to "guesstimate" the ingredients when I'm cooking, relying on taste. I don't blame you at all. It's hard cooking for one. You end up with too much and eating the same thing for the next few days. Besides, I have the same problem with the 3 of us liking different dishes.